If you were to look up the term “tough out” in the Encyclopedia of Mixed Martial Arts Words & Phrases, chances are you would find a picture of Bryan Barberena staring back at you, smiling, with a few cuts and bruises and maybe even a little swelling accentuating his bearded face. Aptly nicknamed “Bam Bam,” the 29-year-old has made eight appearances in the Octagon, winning five, losing three while leaving everyone he’s shared the cage with talking about the overall grittiness of the guy that just gave them one of the most challenging nights of their careers. 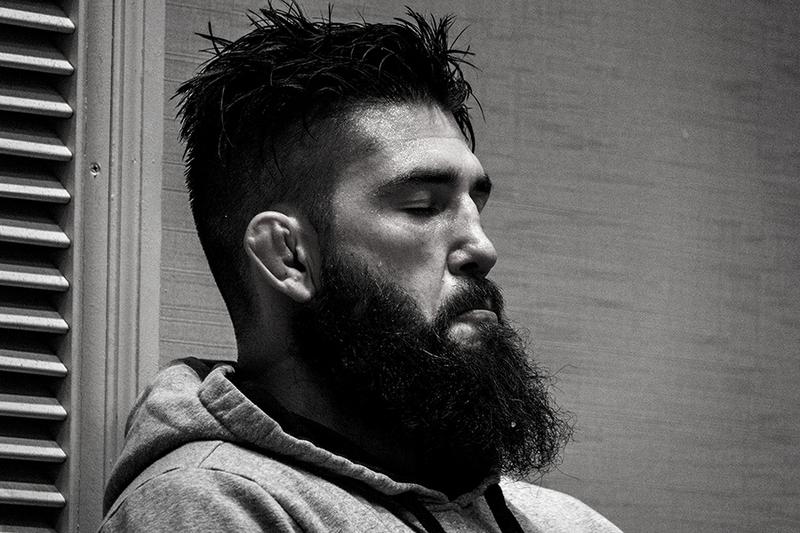 After beginning his UFC tenure by splitting a pair of fights at lightweight, including a Fight of the Night-winning battle against Chad Laprise at UFC 186, Barberena relocated to welterweight, where he has posted a 4-2 mark, registering three stoppage wins and handing Warlley Alves the first loss of his professional career. But it’s the setbacks that really stick out, as the recent transplant to Tennessee has only fallen to a pair of dangerous threats in the 170-pound ranks — former interim titleholder Colby Covington and surging British standout Leon Edwards. 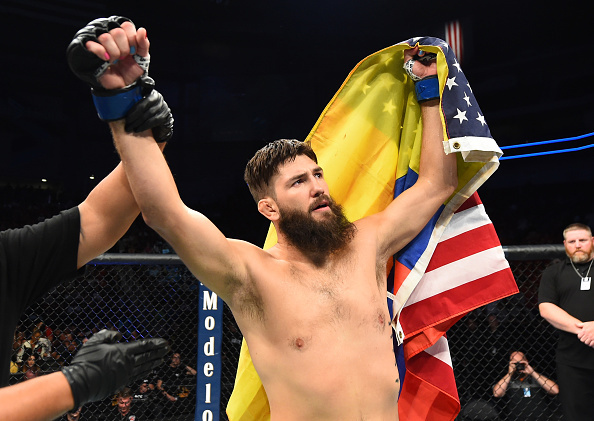 Barberena went the distance in both outings, forcing the championship hopefuls to work harder than they did in some of their more high-profile victories, further bolstering his standing as a guy who is going to make you work hard for every second of the 15 minutes you’ve signed up for when you agree to meet him in the Octagon. This weekend in Phoenix, he steps in with another up-and-coming contender, Brazilian finisher Vicente Luque, who is 7-1 over his last eight fights and entering off back-to-back first-round stoppage wins. “I think this fight is the one (where I take that next step),” said Barberena, when asked about turning some of those strong showings in losing efforts into well-earned wins. “I believe this fight is it. Part of taking that next step has including making a major life change. A couple fights back, Barberena and his family purchased some land in Tennessee and set up shop in “The Volunteer State,” living a life more connected to nature and less connected to the Internet, but he continued to spend his training camps at The MMA Lab in Glendale, Arizona. This time around, however, he’s stayed close to home, spending the bulk of his time preparing for this weekend’s showdown with Luque at Gym-O in Gastonia, North Carolina, mixing in a little work in Knoxville on the side. Although he admits to missing his crew in the desert, being in close proximity to his family has had a major impact on his preparation. “Of course I miss my team, my family at The MMA Lab — (John) Crouch, Benson (Henderson) and all the training partners there — but this time, I decided to run my camp here at Gym-O with Jeff Jimmo as the head coach and he’s running my camp down to a tee. “He controls my diet, my strength and conditioning and all my training this camp,” said Barberena, who defeated both Jake and Joe Ellenburger in what turned out to be the final fights of their respective careers. “I’m really confident in this camp and the coaches and training partners I have here. It’s also a lot closer to home, so that’s great because I get to see my kids frequently and that’s a huge plus. Doing so against Luque is a tough ask, as the former Ultimate Fighter contestant has quietly morphed into a dangerous threat just outside the Top 15 in the welterweight division. After losing his promotional debut, the 26-year-old rattled off four straight wins before dropping a decision to the aforementioned Edwards, who remains one of the most underrated competitors in the division. Since then, Luque has responded with three straight stoppage victories, including a second-round submission finish of Niko Price and consecutive first-round technical knockout victories over Chad Laprise and Jalin Turner, both of which showcased his ability to take a punch and willingness to do so if it means landing something stiffer in return. “I think it’s a great matchup and a potentially really exciting fight — possibly a war, which is more than fine with me,” Barberena said of the pairing with Luque, which sits as the second fight on Sunday’s ESPN main card. 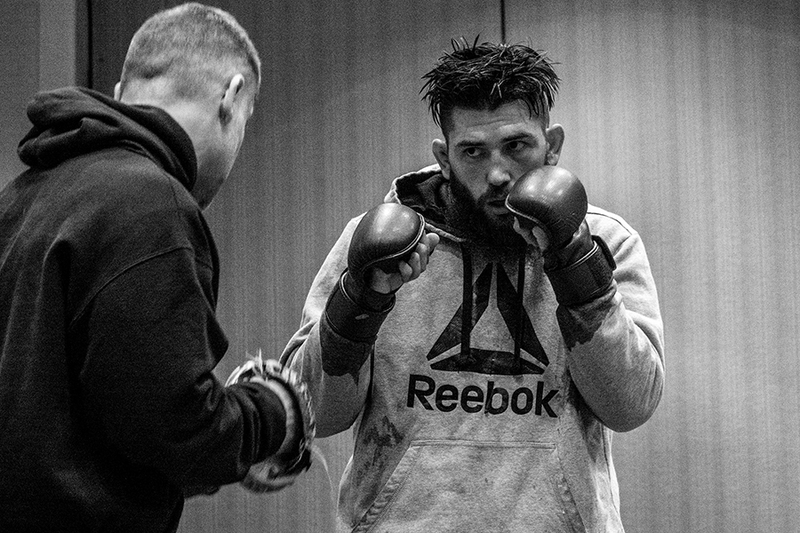 Despite his rough-and-tumble style in the cage, there is an easiness to the way Barberena speaks. Nothing is forced and nothing is said simply for effect — he means what he says and he says what he means — which is why when he talks about Sunday’s main card assignment being the biggest fight of his career and a victory meaning the world to him, you know he’s speaking from the heart. “This is the most important fight for me in my career,” he said. “This is the one that is going to take me past where I’ve been, so I’m really excited about it. I’m excited to put on a great performance and get a finish, so I’m going to come in there and give him everything that I’ve got. “It (getting this victory) means everything, honestly. It means my job is secure. It means double the paycheck. It means I put more food on the table for my family. It means the bills are getting paid easily and there is no struggle. It means absolutely everything. And he’s forecasting a finish. “I see me finishing him,” he said without pause. “I can’t tell you a round because whether it’s the first or the last, it doesn’t matter. If he doesn’t fall down in the first, he can go in the second and if he doesn’t go there, he’s going to get finished in the third. He’s not going to be able to stay in there with me.